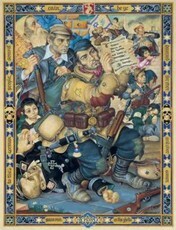 Arthur Szyk (1894-1951), considered to have been the greatest 20th-century illuminator working in the style of 16th century miniaturist painters, also became one of America's most popular political cartoonists during World War Two. The extraordinary life trajectory of this Polish Jewish miniaturist is underscored in an exhibition that brings his later work (with an emphasis on WWII, the Holocaust, the Jewish response, and wartime America) back to Poland for the first time in over 70 years, with showings in Warsaw, Lodz, and Krakow. The official launching of the tour, conceived and organized by the Arthur Szyk Society, will be an opening reception hosted by the U. S. Embassy at the Jewish Historical Institute in Warsaw, with Arthur Szyk's daughter, Alexandra Bracie, attending (exhibit from June 30 - August 12). The exhibit will also be shown at the Palace Poznanski in Lodz, Szyk's birthplace (August 28 - October 3), and finally in Krakow at the Center for Jewish Culture (October 24 - December 31). Arthur Szyk used the techniques of Renaissance illumination to celebrate both the Jewish heritage (most notably in his illustrated Haggadah) and the promise of an independent Poland (in his monumental illumination of the 13th-century Statute of Kalisz, in which Kings Casimir III and IV had guaranteed Poland's Jews fair treatment under the law), then fled the Nazis, crossed the Atlantic, and applied much of those same techniques to celebrate the United States' founding fathers and the Declaration of Independence, and above all to apply the color and precision of his illuminations to anti-Fascist propaganda that made him widely known and loved through the covers of Collier's, Time, and Esquire as America's leading political caricaturist. For more details about the Arthur Szyk Society, the Szyk Renaissance Tour of Poland Oct.21-28, the Szyk Society's informative and richly illustrated Newsletter, or the excellent biography by Joseph P. Ansell, Arthur Szyk: Artist, Jew, Pole, visit www.szyk.org.